Internet plug-in for FileMaker 17 further streamlines OAuth authorization on macOS. 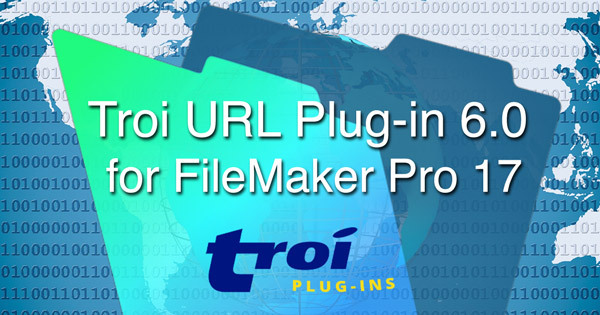 Alphen aan den Rijn, the Netherlands, March 20, 2019–Troi today announced the immediate availability of Troi URL Plug-in 6.0 for FileMaker 17. What is Troi URL Plug-in? Troi URL Plug-in can help you fill in forms on internet, all from FileMaker Pro. It also retrieves data or images from web sites. send tweets to Twitter with ease! What is new in version 6.0? Tested and made compatible with FileMaker Pro 17.0.4. Added new TURL_AuthorizeWithCallbackScript function, which lets a user authorize Troi URL Plug-in to use a web service, for example Twitter. After authorization a script is triggered with a script parameter which contains the access token and secret. By storing these you can then use the web service (like sending a tweet). Currently this is a macOS only function. (Windows) Added code signing to the plug-in for Windows. (On macOS code signing was already added in version 5.0). The plug-in now indicates if an external script step is compatible with a product. The step is shown in grey if it is incompatible for that product (for example for iOS) in the script editing pane (center) and the script steps pane (right). (macOS) Prepared the plug-in for notarization: the plug-in can now be added to a runtime, to create a hardened FileMaker runtime app which can be notarized by Apple. Notarization gives users more confidence, as the runtime has been checked by Apple for malicious components. Modernized the code, made small bug fixes and updated the User Guide and example files. IMPORTANT (macOS only) The minimum supported FileMaker version is now FileMaker Pro 14. Also the minimum supported Mac OS version is now OS X 10.9 (Mavericks). You can keep using v5.x for older versions of FileMaker Pro or Mac OS X. (macOS) The plug-in no longer has the 32-bit code included. More detailed information on all changes and improvements implemented in Troi URL Plug-in 6.0 can be found on the URL Plug-in page. A fully functional demo version of Troi URL Plug-in 6.0 is available on the URL Plug-in page. Licenses cost US$ 79 per user. Details on developer licenses and multi-user discounts can be found on the URL Plug-in page. You can order licenses from our shop. Version 6.0 needs a new registration. The upgrade is free for users who bought a license for Troi URL Plug-in on or after June 26, 2017. Eligible users will be sent a new registration. Contact us if you have not received yours after March 22, 2019. Upgrades from licenses bought before June 26, 2017 are available from US$ 49 per user. Upgrade prices for other licenses can be found in the shop. You can order upgrades there.